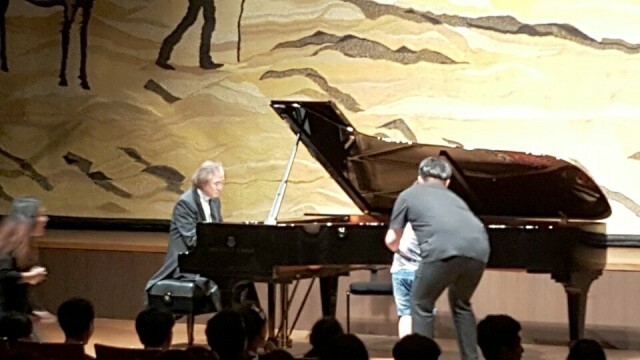 Paik Kun-woo's piano performance on Jeju, which was held on June 11, gave the audience a fresh point of view about how people show appreciation for music. Paik Kun-woo is a world-renowned concert pianist. Born in 1946, he has been performing since he was 10 years old and has performed with prestigious orchestras including the London Philharmonic Orchestra and the Saint Petersburg Philharmonic Orchestra. While he has performed all over the world, there are certain things that are usually the same no matter where he plays. Namely, when in a concert hall, there are certain rules one is expected to follow. After all, it is generally considered that all sounds, apart from the sound of the music itself, are unwelcome noises. The whispering sounds of other audience members is an annoying distraction. People moving in their chairs usually brings noises that take away from the performance. After all, this is why people are not supposed to leave the concert hall until the intermission. By following these rules, both spoken and unspoken, people are free to enjoy a musical performance as it is supposed to be. Right? Well, the performance this article will focus on is one that made me seriously reconsider the way that people can appreciate music and what is really important for a musical performance. The performance in question took place at Jeju Art Centre and was specifically a concert for children with disabilities. During the concert, some of the children moved onto the stage during the performance. This unexpected moment was dealt with incredibly well by Paik Kun-woo. Rather than the moment feeling like something that took away from the performance, the actions of the child felt like someone reacting perfectly naturally to a completely new situation. It all happened in the blink of an eye. About 15 minutes after the performance started, you could hear that some of the children were making noise in the audience. One child kept standing and sitting repetitively. Suddenly, a child stepped up to the stage. When he got there he looked as if he wanted to raise his hand to the piano while staying close to Paik Kun-woo. Since the performance was for children with disabilities, Paik, the audience, and the staff of the concert hall were ready for the situation. They simply guided the child off the stage, although, not before the child showed some graceful movement to step out of the way of his guide. Soon after this, another child went on to the stage. Of course, at this point, the audience were wondering what Paik would do. However, rather than stopping, he simply raised his head and looked into the child's eyes. Everyone watching could feel the warm-hearted look and the tenderness of the moment, even at a distance. As the two of them looked into each other's eyes, it looked like a moment between a grandchild and a grandfather. I saw the emotions of the moment in the look between them and it really felt like the climactic moment of the performance. The decisive and absorbing moment when the piano performance harmonized with the child's body gestures was peace itself for me, not a moment that took away from the performance. Abraham Maslow said an experience like this is the 'flow'. It is the peak experience, not the result of plan. Bach's French Suites No.5 that Paik played perfectly fitted the scene. The child moved his body to the music like a butterfly dancing around a flower. The gestures of a butterfly that might be a language that we cannot understand and we don't try to understand. Without unexpected moments such as these, in which condensed emotions come together to bring a peak experience, how could we possibly transcend our daily lives?